Skirts are one of the oldest and the ultimate faminine garment know to all of us in the history of fashion. Over the years, the style, length and the design of skirts have changed alot to match with the ongoing trends. And as the fashion all over the world changes with the blink of an eye, many new designs and styles have come in. It is an effortlessly easy way to get a chic look. Wrap skirts are the in thing this season. A garment that i feel every woman should definitely have in her closet. Not only do they make you look chic, but they are also amazingly versatile. If styled in a better way, one can come up with different looks for almost all ocassions with the same skirt. Girls who prefer simple but elegant look, can comfortably wear it for every season. The best part is, it has nothing to do with whether you are short, tall, slim or fat. Each one of us can find a way to style it for herself. All you need to know is what to pair it with. 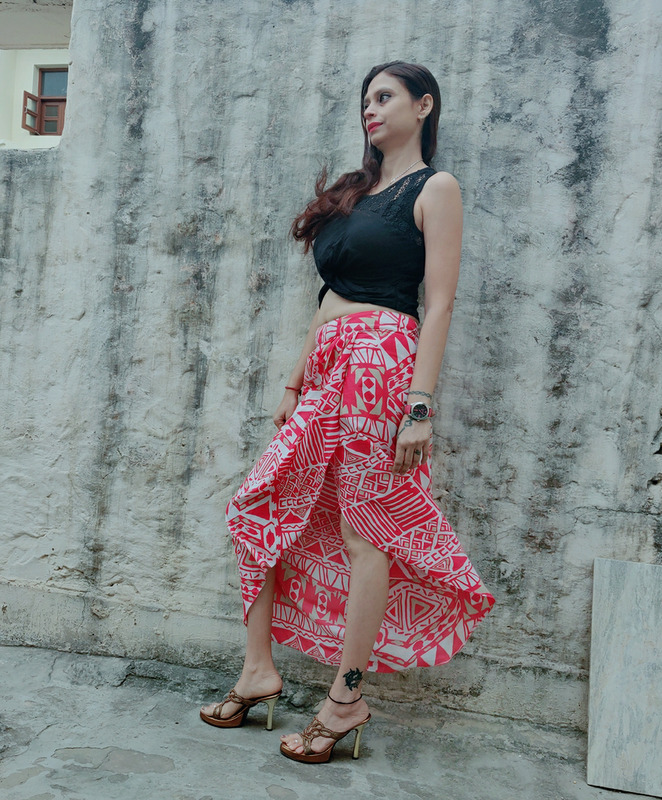 In this blog i am going to talk about a few ways with which you can make a wrap skirt look elegant, graceful and sensous all at the same time. 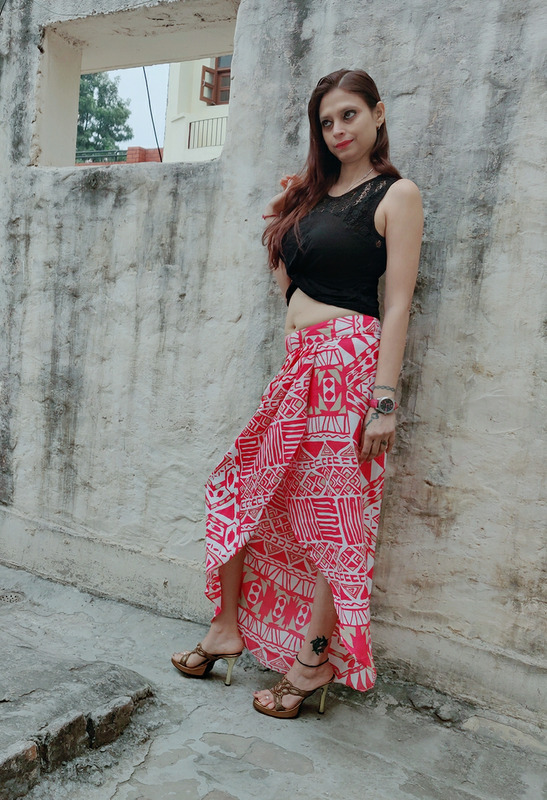 I bought this assymetric peach wrap skirt (470 INR) and crop top(315 INR) online from myntra during the EORS. 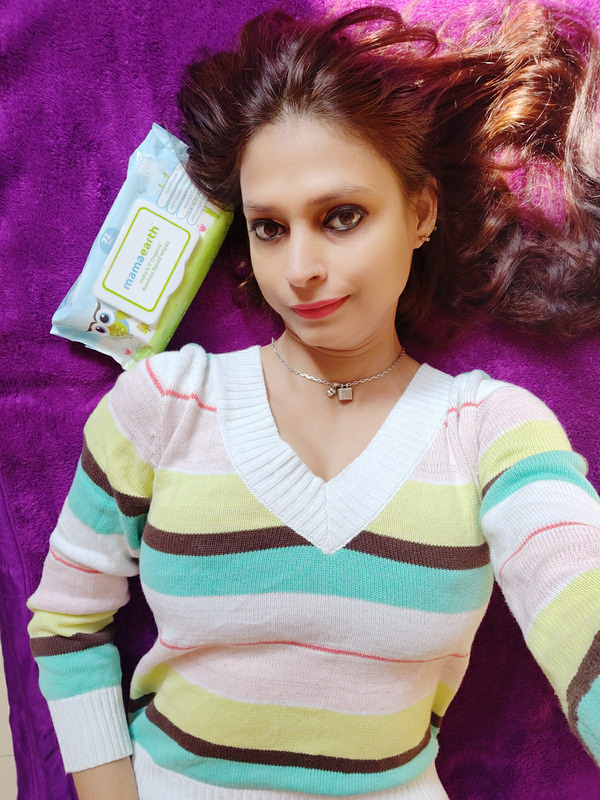 This is one look that can be worn when you are planning an outing with BFFs on a coffee, lunch or a movie date. Wrap top enhances the skirt making a woman look beautiful and chic. 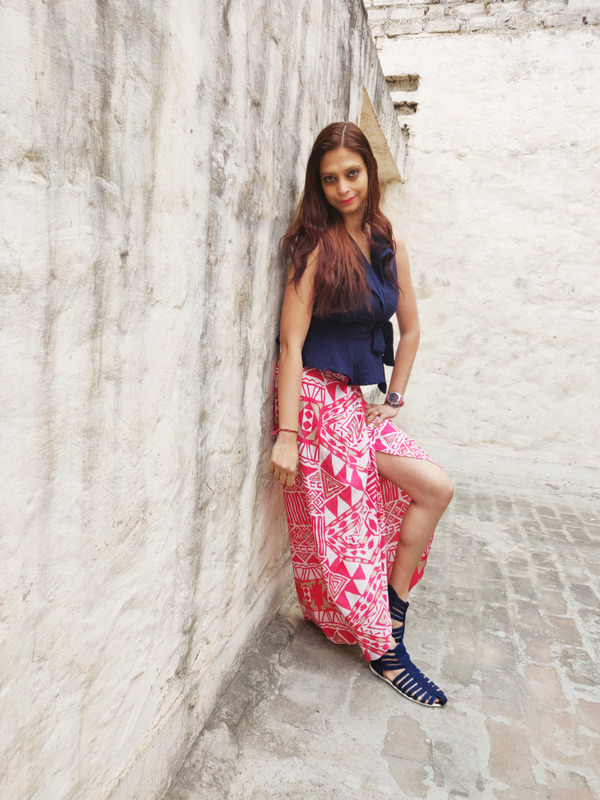 Printed skirt with a solid blue wrap top makes it an awesome combination. Pairing it with flat covered sandles gives it more of a holiday beach look vibes too. 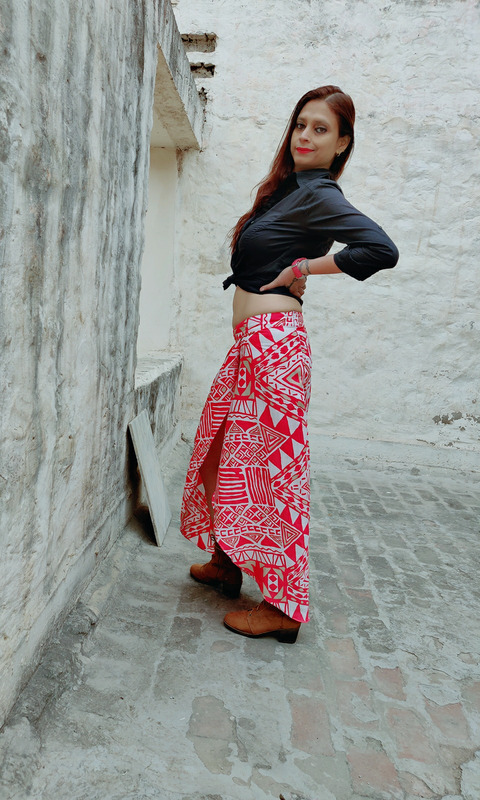 A geometric printed assymetric skirt when paired with solid cotton shirt gives it a beautiful bohemian look, perfect for turning heads. I find wrap skirts pretty graceful, comfortable & easier to walk. It also adds an appeal to the whole look. Pairing it with ankle boots gave it more of a 70's trendy look. One can try wearing this ensemble for a lunch date or a coctail at a bar too. Croptop is that trend from the fashion world that has seen lots of revivals over the decade. One amazingly versatile style that look superb on almost all types of bottom wears that you might have in your wardrobe. I paired this beautiful skirt with a black net crop top and high heels. Making it all elegant and graceful for a dinner date. One can also wear it for an office get together or a party. These are the 3 different looks that i curated with this beautiful geometric printed coral skirt.